This is the BEST recipe for Instant Pot Meatballs! These Italian style meatballs are full of incredible flavor and are the most tender meatballs you have ever had! I am known for my meatball recipe. 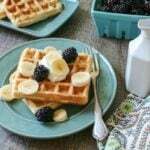 It is a recipe that simply does not disappoint. 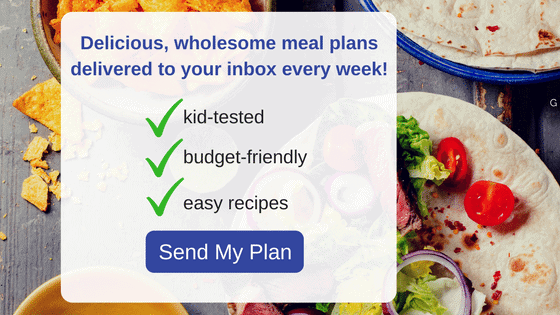 And I have been asked over and over to modify the recipe for the Instant Pot–which I have finally done with success! My traditional meatball recipe is unique because it steams the meatballs to crispy perfection in the oven. They are incredibly tender, yet crispy on the outside and are hands down the most flavorful recipe for meatballs out there. My recipe for Instant Pot Meatballs are just as flavorful and the meatballs are just as tender, if not a bit more tender! 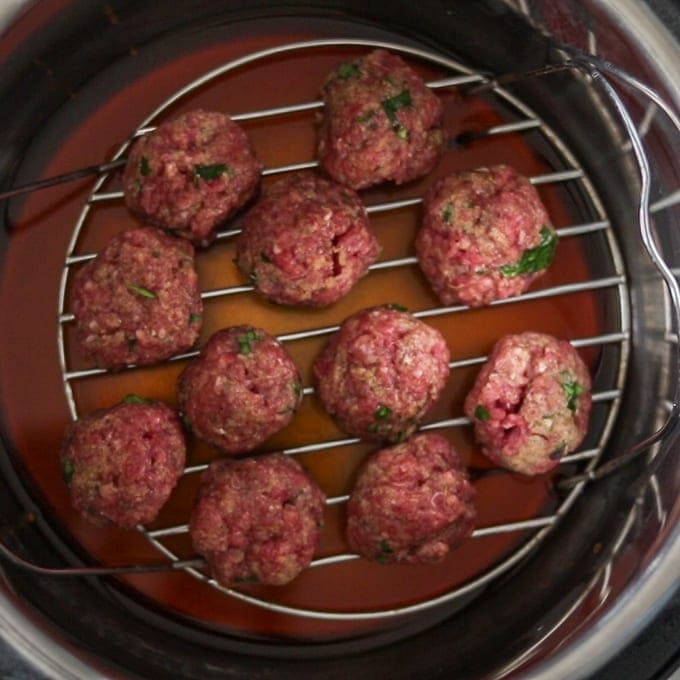 The difference is that Pressure Cooker Meatballs do not have a crispy exterior. I give you suggestions to get achieve a browned exterior, but I have to say these tender meatballs remind me of authentic Italian Meatballs that have been simmered in rich tomato sauce all day–they are just good! Mix together the binding ingredients for meatballs. Add in the ground meat and mix until just combined. Do not over mix or you will have tough meatballs. Roll meatballs into 1 inch balls. At this point, you can freeze meatballs for 10 minutes to make them easier to handle, or you can pressure cook meatballs right away. Pour in 1 cup beef stock into pressure cooker. Use 1 1/2 cups stock for an 8 quart pressure cooker. Water can be used in place of stock if desired. Add in trivet to inner pot of pressure cooker. Gently, place prepared meatballs onto trivet, stacking as needed. Let pressure release naturally for at least 5 minutes before releasing pressure manually. These Instant Pot Meatballs are delicious served alone or with your favorite sauce. 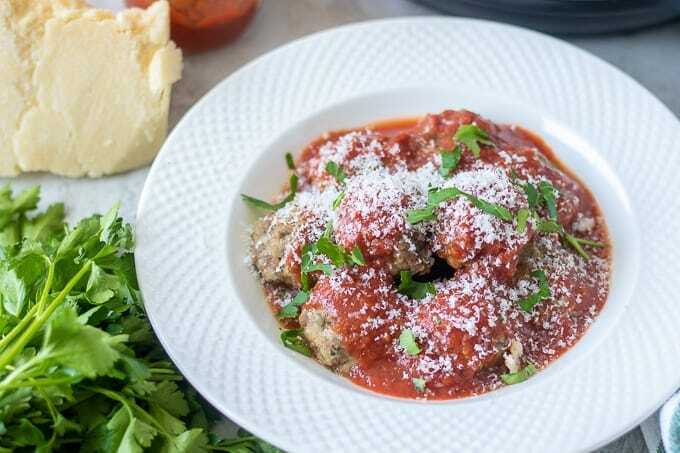 I like to serve these meatballs with homemade spaghetti sauce or Instant Pot Spaghetti Sauce. As I stated, browning meatballs is a completely optional step, and it is a step that can make this recipe for meatballs a bit more complicated. If you would like to brown meatballs, you have 3 options. Once your meatballs are formed, it is essential you freeze them for 10-15 minutes to help hold their shape as they are browning. Turn your instant pot to saute and allow to heat up to HOT. Add in 1 tablespoon oil and heat for 1 minute. Add in meatballs in batches of of 3-4 at a time and brown meatballs on each side 1-2 minutes per side. This is where browning meatballs becomes very tedious. You do not want to overcrowd the pan because flipping meatballs inside the pressure cooker can be a bit challenging. You do not want to flip meatballs too soon, or they will fall apart. Once meatballs have been browned, remove from pressure cooker and repeat the process until all the meatballs are browned. Pour in beef broth and very thoroughly scrape off any browned bits off bottom of pressure cooker. This is a crucial step and if you do not do this, you very well may get a burn notice. Proceed with recipe, decreasing cook time from 7 minutes to 6 minutes. Add in 1 tablespoon oil and let heat for 1 minute. Add in 4-5 meatballs at a time and brown on each side 1-2 minutes per side. Once meatballs have been browned, remove from pressure cooker and place on paper towel lined plate. Repeat the process until all the meatballs are browned. 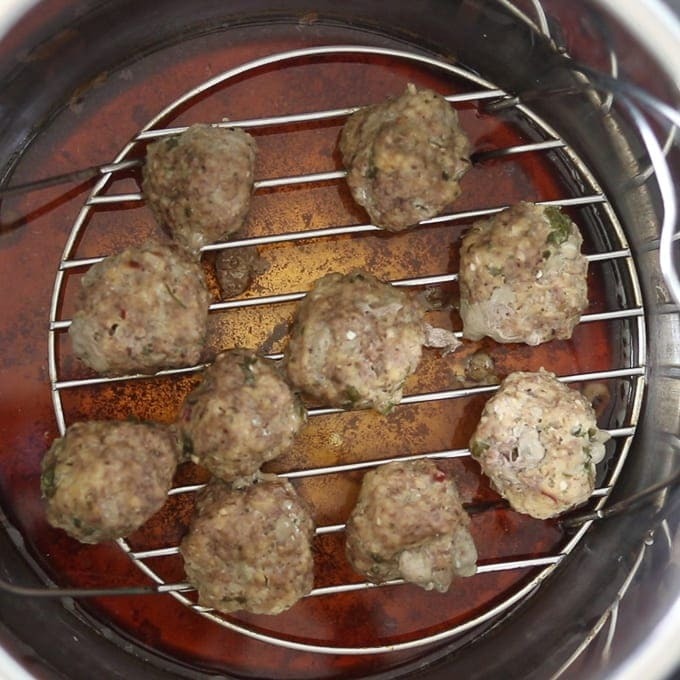 Once the meatballs have been pressure cooked, place cooked meatballs on a broiler sheet pan. Broil on high for 1 minute per side to crisp up exterior. Prepare Instant Pot Meatballs as directed. Place on baking sheet and freeze for 30 minutes, or until outside or meatballs is frozen solid. Remove from baking sheet and place in freezer safe bag or container. Frozen meatballs will keep for up to 3 months. I love to pop frozen meatballs in my ingredients for Instant Pot Spaghetti Sauce and let them cook together. Alternatively, you can pour in 1 cup water or beef broth in bottom of your pressure cooker and place frozen meatballs on trivet. Cook on high pressure for 5 minutes. 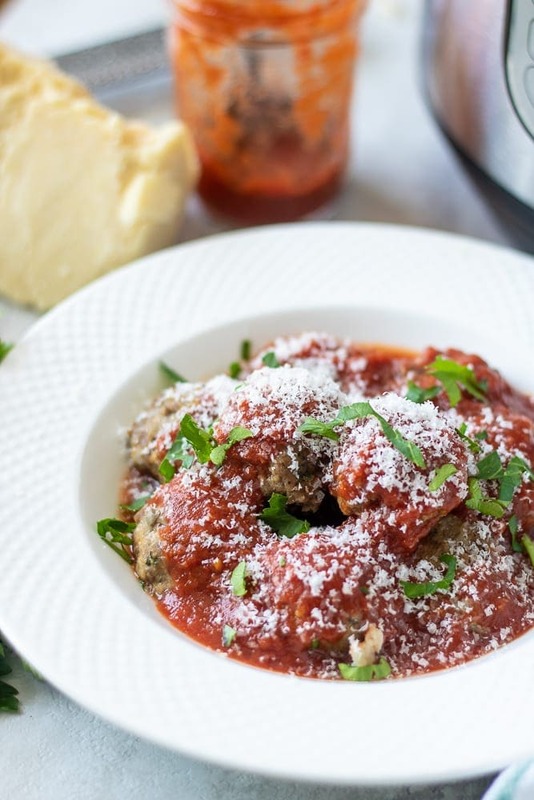 These Instant Pot Meatballs are delicious served with homemade spaghetti sauce or Instant Pot Spaghetti Sauce, or in Meatball Subs. You can use ground beef, ground turkey, ground chicken or pork for this meatball recipe. Instead of beef broth, feel free to use water at the bottom of your pressure cooker. The overall flavor will only be slightly effected. If you want, stir up to 1/2 cup of the beef stock and meatball drippings into tomato sauce for a delicious addition to your sauce for meatballs. For less spice in these easy pressure cooker meatballs, omit the red pepper flakes and cut the pepper in half. 2 teaspoons dried parsley can be substituted for fresh parsley. To keep these Gluten-Free Meatballs, use gluten free breadcrumbs. 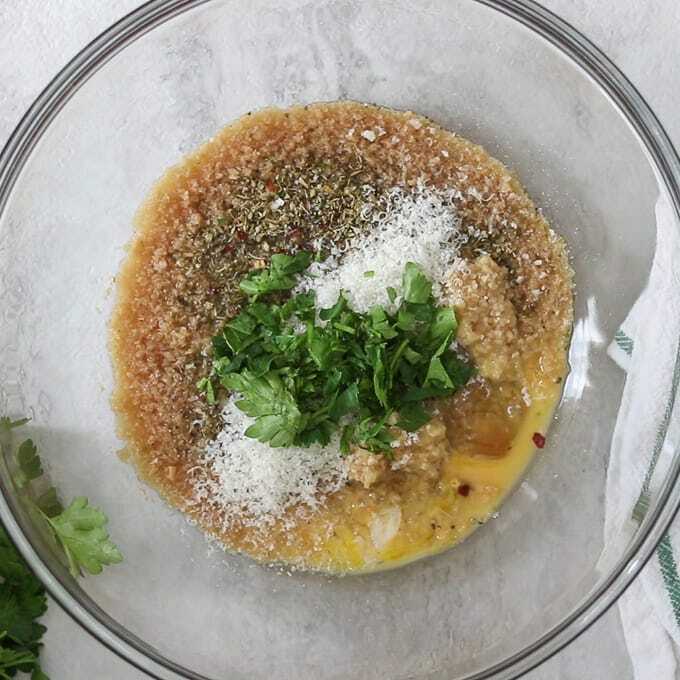 In a large bowl, mix together the bread crumbs, seasonings, Parmesan, beef stock and egg until well incorporated. Add in the ground meat and mix until just combined. Do not over mix or you will have tough meatballs. Roll meatballs into 1 inch balls. Place on cookie sheet. Pour in 1 cup beef stock into pressure cooker. Add in trivet to inner pot of pressure cooker. If you are using an 8 quart pressure cooker, increase water/stock to 1 1/2 cups in bottom of pressure cooker. These meatballs were so easy and so tasty! 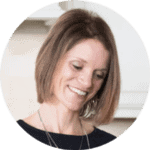 Who would have thought making meatballs in the instant pot would be so easy!!! This looks so incredible!! Thanks Tisha! It really is a great and easy recipe! These were great and I froze some of the batch. As I look now I’m wondering why the frozen directions indicate to put in instant pot for 5 minutes while the original indicates 7. I’d think that from the freezer would need to cook longer? Thanks! !